Located in Sant Joan Despí it is used by the football youth teams and many of the youth teams of the other professional sections. The Ciutat Esportiva's final cost was some 68 million euros, of which 25.6 corresponded to urbanisation and 42.5 to the total construction costs. The club sold two plots of land, the first on June 21, 2002 and the second on February 20, 2003, for values of 29.7 and 15.9 million euros, respectively to cover part of the costs of the operation. The rest of the money was invested directly by the club, an amount of 22.5 million euros. The Ciutat Esportiva Joan Gamper was opened on 1 June 2006. Located in Sant Joan Despí and covering 136,839 m2 it's used by the first team and Barça B traning sessions and youth teams training and matches as well as by many of the other teams at the Club. Now that the complex is fully operational, many of the youth teams that previously used the Camp Nou facilities, mainly the Miniestadi and the Palau Blaugrana 2, nicknamed the 'Picadero', will be training there. The land occupied by the Ciutat Esportiva is just 4.5 km away from Camp Nou and is directly connected by the road between Barcelona and Sant Joan Despí. 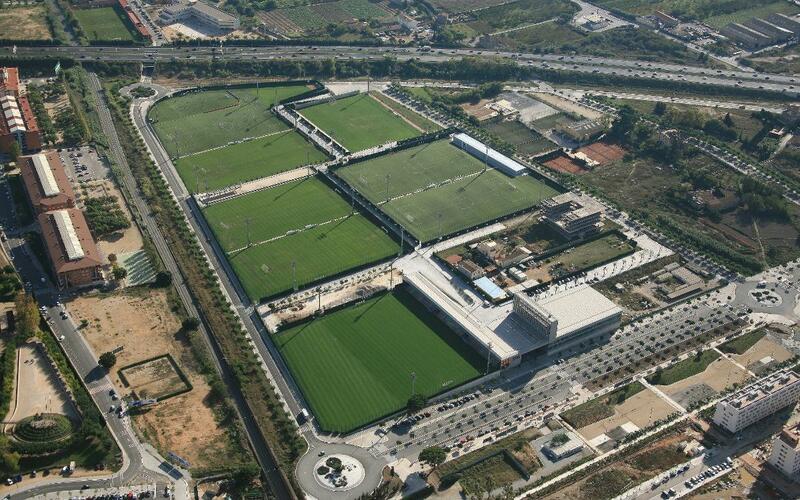 Pitch 1 (now known as Camp Tito Vilanova): 11 a side football (105 x 68 metres). Warm up area of 4,643 m2 all natural grass. Terrace with capacity for 1,400 people approximately. Pitch 2: 11 a side football (105 x 65 metres). Warm up area of 1,475 m2 all natural grass. Terrace with capacity for 400 people approximately. Pitch 3: 11 a side football (105 x 65 metres). Warm up area of 610 m2 all natural grass. This pitch shares terraces with pitch 2. Pitch 4: 11 a side football (105 x 65 metres). Warm up area of 1,573 m2 all natural grass. Pitch 6: 7 a side football (55 x 38 metres). Artificial grass. Pitch 7: 11 a side football (105 x 68 metres). Natural grass. Terrace with capacity for a 1.750 people approximately. Pitch 8: 11 a side football (105 x 65 metres). Warm up area of 1,830 m2 all artificial grass which can also be transformed into a 7 a side football or rugby pitch of 107 x 65 metres plus the try area. Terrace with capacity for 950 people approximately. Pitch 9: 11 a side football (105 x 65 metres). Warm up area of 2,235 m2 all artificial grass. Can also be transformed into a 7 a side football. This pitch shares terraces with pitch 8. Goalkeeper area: Natural grass goalkeeper training area 2.205 m2. The arena also has three basketball training areas that can also be used by youth handball, basketball and futsal teams. The terraces have room for 472 spectators. 5 changing rooms and 5 offices/changing rooms for coaches and referees. Office for doctors and medical staff. The upper floors are mainly exterior and are linked by a walkway to the administration and services building and the pavilion, and are for public and services use. They also access the main football grandstand. There are 64 places in an underground car park for use by Club staff and the Organisational Control Unit.